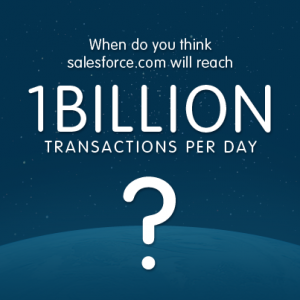 For those of you who like to dive in deep with the numbers and frequent trust.salesforce.com, you may already know that we are getting close to reaching 1 billion transactions per day (yesterday 11/08 hit 974,441,799). That is a huge milestone and wouldn’t be possible without developers creating innovative solutions on the platform. Become a Facebook Fan on Developer Force. Vote for the day you think we will reach the 1 billion transaction milestone on this Facebook poll. Choose the correct day to be entered into the drawing (note: you can only vote once.